The Reverse Osmosis Pressure Tank will allow you to store about 3 gallons of filtered water after your Reverse Osmosis system. Most people do not want to wait for their RO system to make on demand water when filling up a glass for drinking. 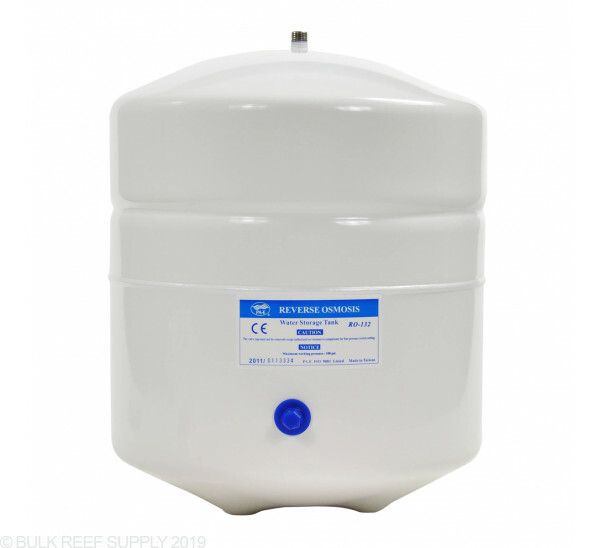 A Pressure tank will store the filtered water under pressure and allow it to come out at a much greater speed saving you time. Holds approxamately 3.2 gallons of water. Reverse Osmosis Tank Shut Off Valve is not included and required for final assembly. I have been using it for months and decided to check the water TDS. To my surprise it was 100 ppm. I disconnected the tank and got 2 ppm TDS. I filled and drained the tank twice. Got 80 ppm TDS after two hours. The tank is leaching something into the water. I hope it is not dangerous because we have been using it heavily. I have this unit for a year already with no problem. Works as advertised. I do recommend. This tank was set up on a drinking water system for a friend six months ago. Recently, he described a loud "bang" come from under his sink when he tried to draw water. I spoke with BRS customer service, who was rather helpful, and sent me a new tank. However I was curious to see how this one had failed, and opted to chop the top off of it. To my suprise, the rubber bladder between the air and water chambers had been blown out of it's sealing ring by a mere 60-65psi of water pressure (with the recompensed 5psi in the air chamber). Even more astonishing, was discovering that the entire inside of the tank was CAKED in rust (<10ppm product water). This unit is nowhere near food-grade stainless. I plan to discard the new one as soon as I can source a superior pressure tank manufacturer. Long story short, this pressure tank is garbage. 2 stars only because BRS was willing to honor their product and send me a replacement. I bought this to supplement my RO/DI system. I have the drinking water kit that maintains pressurized RO water for drinking and my icemaker, but also wanted to have an easy, quick way of getting DI water - and this was the perfect way for me. We are currently using 2 of these on our system. We are able to sustain high volume water pressure for the first 5 gallons of output before the system needs to recharge. Great for large water changes or water changes plus house hold use. This does what it is supposed to do. Just remember to buy the tank shutoff valve. I think it should have been included, as I cannot think of how to hook up the tank otherwise. I wish it had a little more pressure to allow better water flow out, but then I'd probably waste a lot of water from the filter unit. Just remember to buy the tank valve also. That is the only reason not rated 5 stars. When you buy the Drinking Water Kit, it comes with everything you need including the shutoff valve and many other connectors. It does cost a little more, but like I said, it has everything you need and more. Ordered the individual parts to add Drinking Water to my RO/DI system. Got the pressurized tank, the faucet, all the tubing necessary to get from the RO/DI to the under the kitchen sink installation. These things are 8 ft apart with a wall inbetween, a dishwasher and some cabinets, but actually the installation was easy. Again watch those BRS videos, they are very helpful. I assumed this tank would come with the valve for the top. It does not, I ended up having to fork up the $5 for the valve as well as $7 for shipping. I think this ad should specify "tank only, valves sold separately" not a common valve either.. Home Depot or any other local hardware store did not have this simple piece of plastic. I purchased the 5 stage R/O system and it came with a ton of extra connections. When I purchased this unit I assumed it came with the on/off valve. Dissapointed that I have to wait another week to install this unit as none of the hardware stores around have this particular fitting. got the unit the next day. well made tank. What us the pressure in PSI of the water coming out of the storage tank? Can the line from the tank be connected directly to the r/o float valve or would the pressure be too high for it to shut off? The pressure in the tank is not all that much, just enough to force the water through. 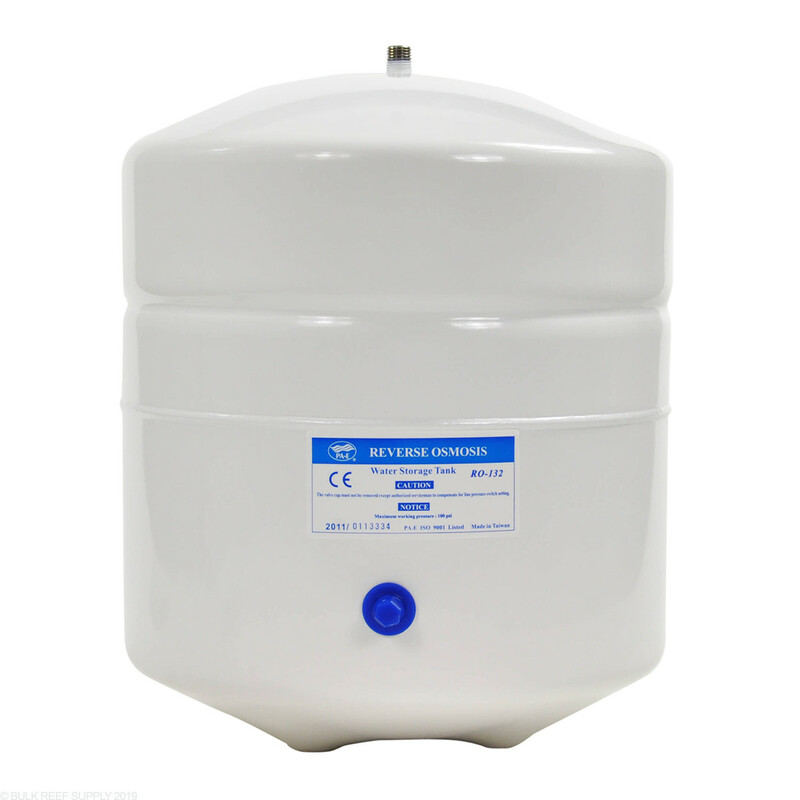 Typically storage tanks are around 5-6 PSI. Using a float valve coming out of the pressure tank can work just as well as a faucet for example and would be a perfect option. Feel free to let us know if you have any further questions! I previously purchased 6 stage system and want to tap off form it to use also for drinking water, but don’t need the faucet kit as I have most of the parts. Does the tank come with Mur-lok Push Connect fitting? Is there a bracket available to mount this tank on the wall? Do you have instructions for connecting? I assume for 6 stage system, connection should be made just before DI resin, followed by check valve, then ball valve, then this tank. Thanks! This does not come with the push connect. I have linked it below. As for installation, you are correct in the order. I have this tank installed in the basement and have a drinking water faucet on the first floor. I have been using for the last few years and I suddenly noticed that there is no more pressure at the faucet. It starts pretty good but it it slows down instantly. Can the tanks go bad/pressure drop after a while? Or is this a different issue? How do you remove tubing from connectors on the BRS RO/ DI filters?